The NeCS project-team goal is to develop a new control framework for assessing problems raised by the consideration of new technological low-cost and wireless components, the increase of systems complexity, and the distributed and dynamic location of sensors (sensor networks) and actuators. In this framework, control design is performed under general resources constraints including communication, computation, and energy. In that, the team targets an innovative step forward in the feedback design for networked controlled distributed systems by the development of combined control, computing & communication co-design. The project-team is bi-located at INRIA (Montbonnot) and at the GIPSA-LAB (at the Grenoble campus). The field of Networked Controlled Systems (NCS) refers to feedback systems controlled over networks, as shown in Fig 1 . 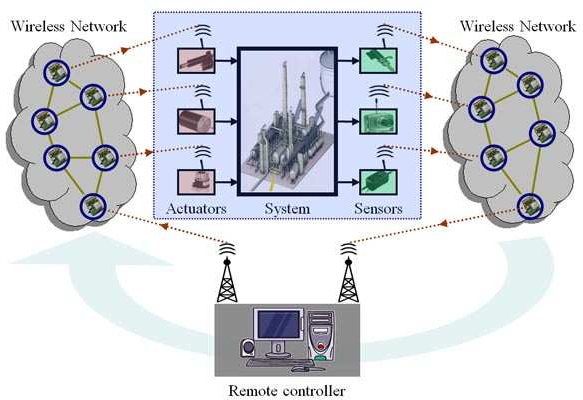 Such systems present new control problems posed by the consideration of several factors, such as: new technological components (i.e., wireless sensors, RF communications, adhoc networks, etc. ), increase of systems complexity (i.e., increase in the number and variety of components), the distributed location of sensors and actuators, and computational constraints imposed by their embedded nature (i.e., embedded systems and systems on-chip). In this class of systems, the way that the information is transferred and processed (information constraints), and the manner in which the computation/energy resources are used (resources management), have a substantial impact in the resulting stability and performance properties of the feedback controlled systems. Inversely, the already designed feedback system can be affected by the properties of the channel transmission (latency, fading, delay jitter, lost of data, etc. ), and the way that the computational and energy resources are used.